Create your Amish furniture Empire with this exceptional Barstool. You are sure to feel like royalty each time you make use of this gorgeous chair. Handcrafted for your home in the heart of Pennsylvania Amish country, no two barstools are alike and you will certainly be able to tell! Choose to order your barstool as a side or arm chair. That is just the beginning of the customization process. You'll be able to select the wood and stain that you wish to have your barstool made and finished in. Make the furniture of your dreams a reality today. 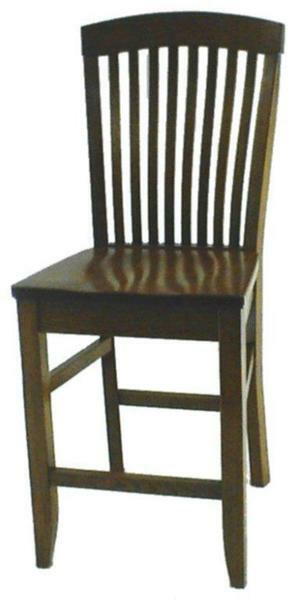 If you have any questions about this Barstool, please call 1-866-272-6773 to speak with an Amish Furniture specialist who would be more than happy to assist you. The Amish Empire Barstool usually ships within 7-9 weeks. 24" seat - Overall Height 44 1/2"
30" seat - Overall Height 50 1/2"